As you are undoubtedly aware, Digital First Media announced Sept. 12 that it is exploring the possibility of selling its papers. In an effort to keep you abreast of goings-on with the potentially possible exploration of the possibility of maybe selling all, or some, or none, or maybe all but the papers with “Post” in the name — perhaps — we will collect on this page whatever useful tidbits we run across. Nieman Lab, July 9 • At Digital First Media, America’s second-largest newspaper chain, it’s hard to discern a larger plan — beyond painful cutbacks to boost profits. Nieman Lab, April 2 • From coast to coast, the spring scent of newspaper transactions hangs in the air. The big one — Apollo Global Management’s purchase of Digital First Media — is nearing completion. Meanwhile, sellers from New York City to southern California test the mettle (and wallets) of would-be buyers. Expect that the biggest transaction of titles in recent history will be announced by the end of April. Apollo, acting within its exclusivity agreement to buy DFM, is now finishing its due diligence and arranging its financing of the $400 million deal. The Denver Post, March 16 • The giant private equity fund Apollo Global Management is the front-runner in negotiations to buy Digital First Media, publisher of the Denver Post and 13 other newspapers in Colorado, according to reports. Capital New York, March 3 • News of the imminent sale comes at a time of increased roiling in the newspaper property market. The Digital First Media sale, involving 75 dailies, should be announced soon (“Cerberus, Apollo bidding for Digital First Media”) and owner Mort Zuckerman just put the storied New York Daily News up for sale. Further, New Media Investment (né Gatehouse), backed by Fortress Investments, has become a major national roll-up player, with recent transactions in Las Vegas, Providence and the southeastern U.S. As print-ad revenues continue their steep decline, more publishers want out. Capital New York, Jan. 23 • After one cost-cutting private equity company has spent close to half a decade wielding the knife at Digital First Media, how many new “efficiencies” might a second P.E. buyer find? That’s the question we may soon see answered, as the sale of Digital First Media’s winds toward a completion. I’ve learned that two big private equity companies are participating in the penultimate rounds of bidding for D.F.M.’s papers. Cerberus Capital Management, with $25 billion in assets under management, and Apollo Global Management, with $164 billion A.U.M., both eye what would be the single largest sale of newspaper assets in recent history. Newsonomics, Jan. 16 • Bidding is still in progress, as DFM’s regional business heads coast to coast make presentations to would-be buyers, anonymous to them, by conference call. They share deeper and deeper financials, as those bidders fine-tune how much to offer. Westword, Dec. 11 • Yesterday, we shared speculation about a possible Rocky Mountain News reboot by gazillionaire Phil Anschutz, with speculation suggesting that an online prototype was a ploy in negotiations to purchase the Denver Post, which has been up for sale since September. The Gazette, Dec. 10 • The owner of The Gazette is exploring the possibility of reviving the Rocky Mountain News, the longtime Denver daily newspaper that folded more than five years ago. Denver Business Journal, Dec. 9 • Denver billionaire Philip Anschutz is exploring the possibility of reviving the Rocky Mountain News, the Denver daily newspaper that shut down in 2009 after nearly 150 years of publication, the Denver Business Journal has learned. Nieman Journalism Lab, Nov. 6 • Will America’s third-largest newspaper group sell as a single unit or a collection of smaller clusters? And what would lead someone to buy newspapers in 2014, anyway? CNBC, Oct. 1 • Despite the doom and gloom, some of the savviest investors in the world are buying in. Billionaire Warren Buffett bought 28 regional newspapers for $344 million over 18 months in 2011, 2012 and 2013; his BH Media Group now owns 69 titles. Amazon founder Jeff Bezos bought The Washington Post in 2013 for $250 million. And former hedge fund manager and Red Sox owner John Henry bought The Boston Globe last year for $70 million. The Denver Post, Sept. 29 • While not directly related to the sale of DFM papers — yet — here’s a list of five Colorado billionaires who made the Forbes list of richest Americans. If Philip Anschutz were to pay $50 million for the Post, that would represent 0.45 percent of his $11.1 billion estimated net worth. To put it in perspective, to someone with a net worth of $50,000, that would be $225.23. So, relatively speaking, chump change. Nieman Journalism Lab, Sept. 25 • Could the sale of the Digital First Media properties lead to the U.S.’s first quasi-national newspaper company? That’s the hope of DFM’s current owners, and the shiniest lure tossed out into the newspaper property marketplace by UBS, the unorthodox pick of DFM to be its banker/broker as its six dozen dailies are being shopped. Papers for sale, who’s buying? Nieman Journalism Lab, Sept. 24 • Local buyers seem, in many cases, to be the last ones standing; the hedge fund money is fleeing or has fled, and your local daily could probably be had for a song. A number of regional nonprofit news orgs have had successes in journalism but struggle to find audiences. And many potential buyers are more likely to be spurred by civic duty than by visions of dollar signs. The Denver Post, Sept. 13 • Digital First Media’s decision to pursue “strategic alternatives,” including a possible sale, could result in The Denver Post, and 13 smaller newspapers in the state, operating under local ownership by early next year, media analysts predict. 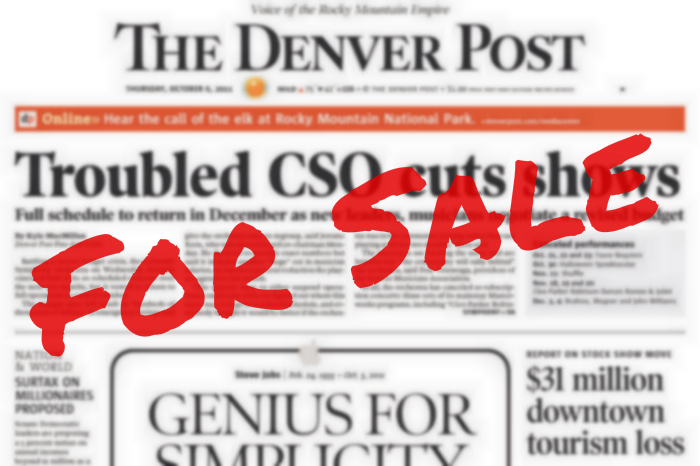 Denver Post For Sale: Anschutz? Polis? Gill? Citizen Kane? Poynter, Sept. 12 • Digital First Media has hired UBS Securities LLC to help it determine what it calls “strategic alternatives for the Company’s business.” That could involve a sale of some or all of the company’s news products, which include 76 daily papers and 160 weekly publications. Romenesko, Sept. 12 • The publisher of the Denver Post, San Jose Mercury News, St. Paul Pioneer Press and other newspapers says it’s hired UBS Securities to “evaluate and consider strategic alternatives,” including selling all of Digital First Media, just some of its newspapers or doing nothing. Westword, Sept. 12 • Over recent months, there have been rumors aplenty that the Denver Post and other newspaper properties under the Digital First Media banner would soon be put up for sale — a prospect supported by members of the Denver Newspaper Guild, who published an open letter earlier this week that essentially advertised for a new, local owner. Denver Business Journal, Sept. 12 • Digital First Media, the operator of The Denver Post, said Friday that it will “evaluate and consider strategic alternatives” that could lead to the sale of some or all of the company. Digital First (John Paton’s blog), Sept. 12 • We announced this morning our company, Digital First Media, is working with the investment bank UBS to review the strategic alternatives for our business. Strategic alternatives — what does that mean exactly? Well, it could mean we decide to sell the company. Or sell parts of it. Or expand it. Or stay the course. It has been clear for some time that the hedge fund which owns the majority of Digital First Media was not operating the company as a long-term investment. Under the right conditions, a sale can be a positive development for our members and the communities they serve. We will continue our efforts to identify potential buyers for local papers or clusters of papers. News organizations, such as DFM, while operated for profit, remain a critical service to any community. We welcome hearing from all potential investors who understand the importance of supporting quality journalism and local jobs. Pacific Media Workers Guild, Sept. 10 • Few things focus the mind like being told you have 72 hours to decide your future. A group of local investors had reached an agreement in principle to purchase the Santa Rosa Press Democrat and affiliated papers in November 2012 from Florida-based Halifax Media. All that was left to consummate the transaction was for the unionized newsroom staff to ratify a new collective bargaining agreement, in which case the bank would finance the deal.